Are you looking to convert an area in your house into a Home Office? Mangan Joinery can help with all your home office requirements by offering a range of designs and finishes to suit many budgets. We can meet you either at our office or your home to discuss your needs. Our designer will come to your home to chat to you, find out about your lifestyle, discuss your ideas, work out what you need storage-wise in your new home office and then create the perfect plan just for you. It’s all very low key and relaxed, and there’s no obligation to sign on the dotted line, our aim is to create a room that’s suits your needs within your budget. And the best thing about the service is it’s free. 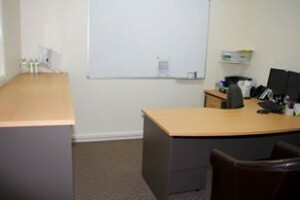 We don’t stock any ‘off-the-shelf’ office furniture as everything we supply and install is custom made. We can work around your existing furniture but do find that sometimes you don’t make the most of your available space by trying to fit around what you already have. Every room is different and we are happy to discuss this with you, and help you make the most of what space you have available no matter how awkward. Regardless of whether you need a small room converted, or a larger home office space for several users, we offer a range of designs and finishes to suit many budgets. Our tradesmen are fully qualified and employed by Mangan Joinery. Often home offices require smart wiring for data and electrical, and we can leave access for cables etc and work with your IT guys where necessary. Our office fit outs for businesses are designed to give you a stylish and functional office space at an affordable price. We offer a huge range of high quality commercial materials to design and build all your office needs including workstations, screens, office desks, meeting tables and office chairs. From small office fit outs through to multiple sites locations, our custom office fit outs can help create a stylish and productive new environment for your team. Here at Mangan Joinery, we understand each business is unique, which is why we offer custom solutions to match your style, layout and budget. Whatever the challenge, our team is up to the challenge..